Do you want to try a pre-workout supplement but are sensitive to caffeine? Or maybe you are concerned with ingesting too much caffeine. Below we will go over why a caffeine-free pre-workout might be a good option and some advice on how to choose one. For most of us, getting into the proper mindset to train isn’t exactly easy. Maybe you’re just rolling out of bed, half asleep, and you need to get in a workout before you head to work. Or, maybe you’re finishing up a busy day, wondering where you’ll find the energy to put in time at the gym. Enter pre-workout, the tiny miracle that transforms so many of us into superheroes minutes before we hit the gym. Unfortunately, so many of the pre-workout supplements on the market provide us with a short-term solution that can result in long term problems. It seems like each year; another supplement manufacturer is in the crosshairs of the FDA for including powerful and dangerous ingredients in their pre-workout supplements. Fortunately, there are some options on the market that you can feel confident taking; supplements without caffeine, or other potentially harmful stimulants. It’s no secret that stimulants like caffeine are among the most popular and powerful ingredients in pre-workout supplements. Unfortunately, this presents issues for many people. Others are unable to tolerate caffeine at all. Many of us, especially those who are particularly sensitive to caffeine find it difficult or impossible to get a good night’s rest after taking pre-workout supplements. This is especially true for those of us who work out in the late afternoon or evening. This is because many popular pre-workout supplements contain upwards of 300mg of caffeine per dose, which is roughly the equivalent of half a pot of coffee. In addition to the physical boost that caffeine can provide, there’s also a mental boost associated with caffeine usage as well. With that mental boost comes the potential for addiction. Caffeine addiction can result in some nasty side effects and withdrawal symptoms as well. While most people have a positive reaction to caffeine, for some of us, that isn’t the case. In some people, caffeine usage causes symptoms ranging from nausea and stomach pain to anxiety, tremors and more. If you’re dealing with high blood pressure, you’ll want to steer clear of caffeine and other stimulants. Stimulants like caffeine function through a process known as vasoconstriction, which is a tightening of the blood vessels. This leads to a spike in your blood pressure. If you’re already dealing with high blood pressure, to begin with, this added spike can lead to potentially fatal complications such as heart attack or stroke. Even for those of you who enjoy the benefits of caffeine in a pre-workout supplement, it’s always a good idea to take some time off from caffeine periodically. The reason for doing so is two-fold. First, since caffeine is habit forming, it’s a good idea to take a rest every now and again to break your dependence on the drug. Plus, like almost all drugs and supplements, our bodies build up a tolerance to caffeine over time. This means that over time, you’ll have to take more and more caffeine to experience the benefits you’re used to. So, taking a break from caffeine has a few benefits you may want to look into, and when you do take a break, you’ll want a stimulant-free alternative that you can fall back on when it comes to a pre-workout supplement. When it comes to a caffeine-free pre-workout, there are many different compounds that make viable substitutes for caffeine. Here are some popular ones you may want to look for. This amino acid is arguably the most well-researched and trusted workout supplement on the market. Creatine has been proven to increase strength and promote muscle growth while also minimizing the muscle damage that occurs during a workout. While it seems that creatine is most effective as a post workout supplement, there’s certainly some evidence that supports its use as a pre-workout as well. Citrulline is an amino acid which allows the body to increase its nitric oxide (NO) production. Nitric oxide is a vasodilator, which widens blood vessels and promotes increased circulation. Studies have shown that citrulline helps to increase concentration while decreasing muscle fatigue. The addition of malate, which is essentially just malic acid, has been shown to increase energy levels, similarly to what you’d expect from stimulants like caffeine. This is another helpful amino acid which can help reduce muscle fatigue and muscle soreness. Inside the body, beta-alanine combines with the amino acid histidine. Together, these two amino acids make carnosine. Carnosine is helpful because it regulates the pH of our blood. As we work out, our bodies produce more acid, which leads to the feeling of muscle fatigue. Carnosine acts as a buffer which inhibits the acid in our bloodstream from causing muscle fatigue, which allows us to work out for a longer period before fatigue can set in. Betaine occurs naturally in certain fruits and vegetables, like beets. While it’s still in its relative infancy as a supplement, some studies have shown that it can help to increase strength and muscle endurance. One of our favorites is Genius Pre from the Genius Brand. Instead of focusing on caffeine and other stimulants to deliver a boost before your workout, Genius Pre focuses on providing a healthy dose of several different ingredients known to increase stamina, endurance, and nitric oxide production. 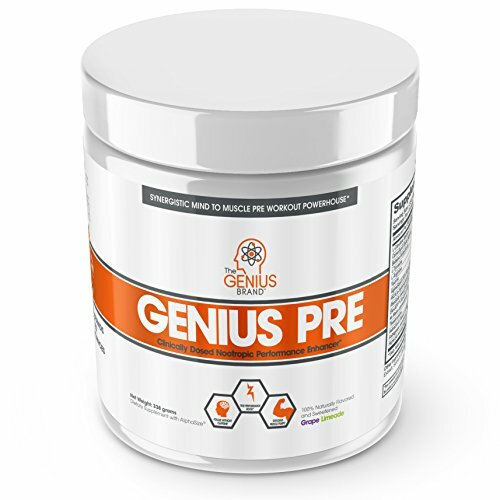 Genius Pre also includes plenty of fancy nootropic ingredients which are said to provide a mental edge similar to what you’d expect from caffeine, without any of the negative side effects. To top it off, Genius Pre swears off artificial colors, sweeteners, and fillers to provide the cleanest supplement possible. TOP NITRIC OXIDE PRE WORKOUT. Agmatine sulfate and Betaine Anhydrous dramatically increase nitric oxide production. 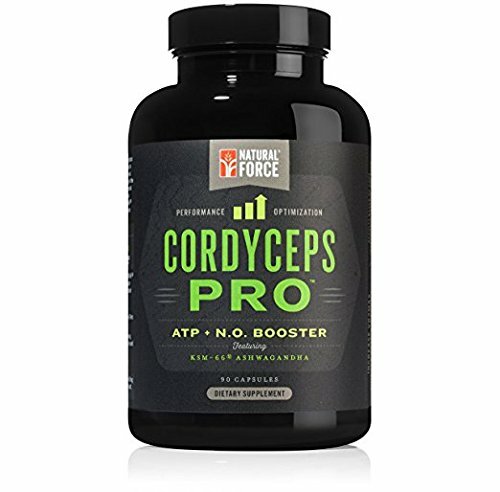 This simple and effective pre from Muscle Feast is available in available in both caffeine free and regular varieties, and two different flavors. Our favorite thing about PUMPED caffeine free is its simplicity. The ingredients are laid out in plain English, and they aren’t hidden behind a proprietary blend. Inside each serving, you’ll find Beta-Alanine, Agmatine, Betaine, L-Taurine, L-Tyrosine, and Higenamine HCL. These ingredients combine to increase nitric oxide as well as overall energy levels during a workout. If you opt for the flavored version, there’s also some natural and artificial flavors and artificial sweeteners as well. POWERFUL ADAPTOGEN BLEND - Featuring KSM-66 Ashwagandha, Cordyceps Sinensis, Cordyceps Militaris, Rhodiola, Schizandra Berry, Green Tea, Grape Seed, and Hawthorne. CAFFEINE AND SIMULANT FREE ADRENAL SUPPORT - Experience a natural enhancement of energy levels, mood, and mental clarity without taxing your adrenals with stimulants and caffeine. This pre-workout from Evlution Nutrition manages to include practically every ingredient you’d want in a pre-workout, except for caffeine. It includes many powerful compounds that boost nitric oxide. 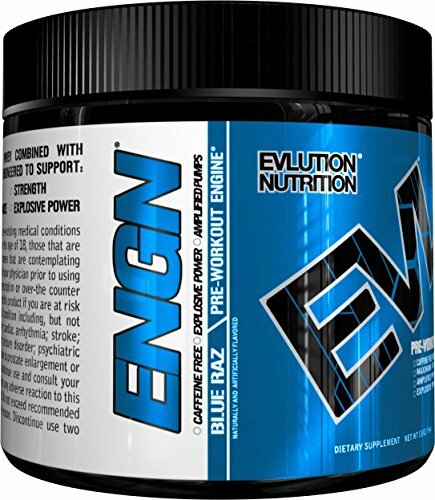 Evlution also claims that this pre-workout boosts mood while helping to promote muscle endurance and delay fatigue. Unlike most pres, it’s available in different flavors as well, so you’ll probably be able to find something that suits your taste. While ENGN includes practically everything you’d need, the doses of each ingredient are hidden behind the old “proprietary blend” which is certainly cause for an eyebrow raise or two. That said, ENGN still manages to perform well as a pre-workout. When it comes to any supplement, it’s important to note that each person is different. Therefore, your mileage may vary. That said, each of these five pre workouts provides a compelling option for those looking for a caffeine free alternative to the popular pre-workout supplements on the market. But, there can only be one winner, and with that in mind, we’ve chosen Genius Pre from The Genius Brand as our favorite. Genius Pre delivers on every level. It provides energy, it provides a significant pump, and with all natural ingredients, you know that you aren’t taking a supplement that’s packed with fillers and artificial flavors. If you’re looking for a powerful caffeine free pre-workout, this may be the most viable option on the market.